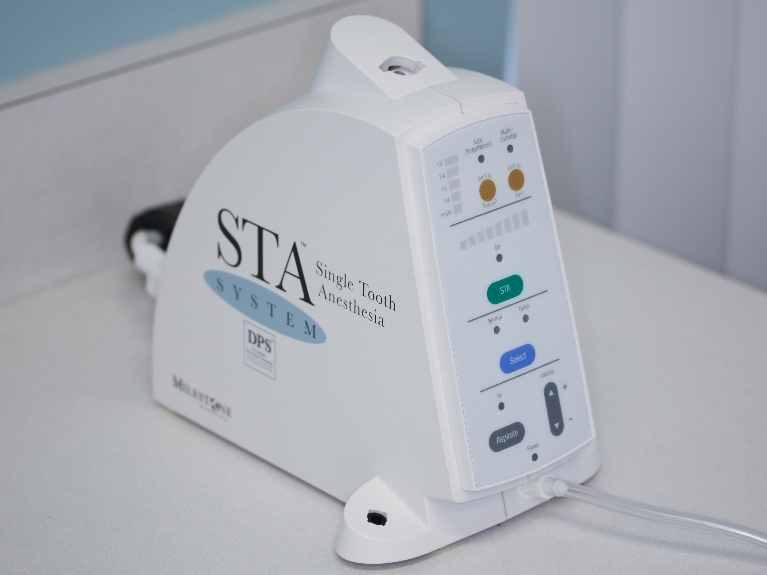 The Single Tooth AnesthesiaTM (STA) System is one of our favorite pieces of technology in our office. As its name states, the STA is great for getting a single tooth numb for a dental procedure. If you have ever had to get work done on a lower molar, you may recall having to have the entire side of the jaw anesthetized leaving you a little “drooly” at the end of the appointment. Up until now, we did not have another option. Whether one tooth or multiple teeth needed to be worked on, we traditionally had to block the entire nerve that affects half of the jaw. The STA is a great way of putting single teeth “to sleep” without affecting nearby structures, allowing you to have full control of your tongue and lips immediately after the procedure has been completed. No more walking out of the dental office with your face half numb!